_ Everything in Mexico is a story and every story is about a relationship. I didn’t bring an anvil with me when I moved to Mexico. I had long ago sold the Haybuden I bought from Bill Gichner in 1981 or so, and by 2009, anvils were collectible and expensive. I was sure there’d be cheap anvils everywhere in Merida. I figured wrong. When I started my search, I looked up Herrerias (iron shops), wrote down a few addresses and headed out to look for "un yunque". Driving out calle 59, I spotted a used machinery dealer and stopped. 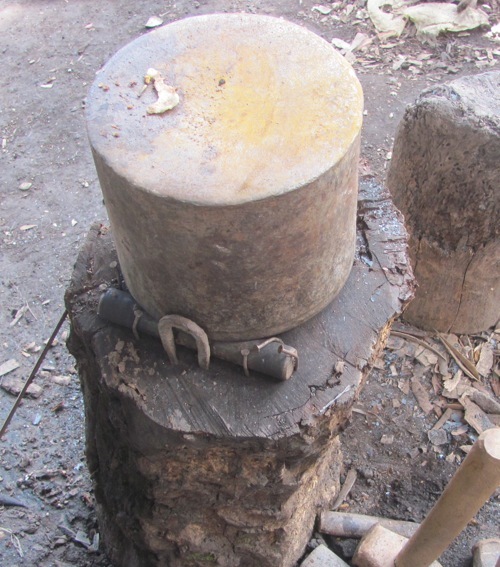 "Yo quiero a comprar un yunque" The woman in the office brought me back into the workshop and explained to the old man there that I wanted to buy an anvil. 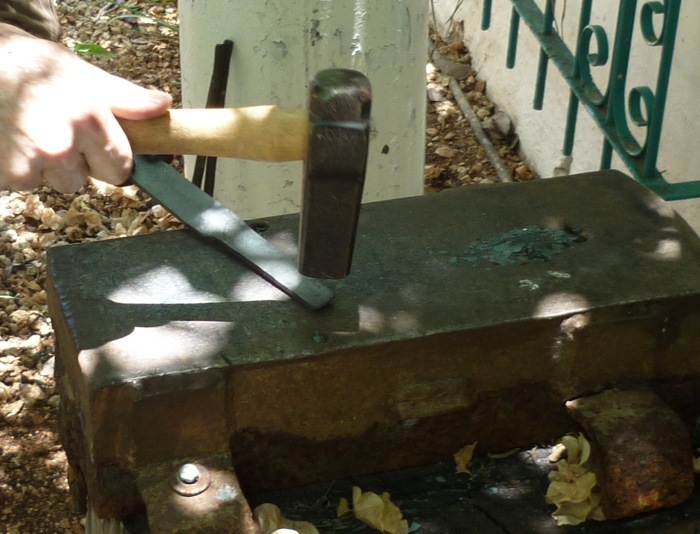 The old man spoke no English, but indicated that yes, he had an anvil somewhere. He led me past old saws, lathes, milling machines and machines for which I had no clue of their use. We looked behind piles of old machinery and boxes of parts. He pulled away some tarps and pieces of wood and asked me to look...I had to crawl under some equipment and there it was...a really beautiful old blacksmith anvil. It looked to be in great shape, about a hundred and fifty pounds, nice smooth flat face, perfect. I figured "this is Karma" I was meant to be here now and the anvil was meant to be mine.........I was living life fully and truly and the universe had provided for me. "no esta a la venta" It’s not for sale! Excuse me? No esta a la venda. He didn’t want to sell it. He hadn’t used it in decades, but didn’t want to sell it. I’ve learned that craftsmen here never get rid of anything, no tool or scrap of material, because everything is so difficult to replace. _I spent the next week visiting iron working shops looking for un yunque. I didn’t find a single shop that even used a real anvil, let alone had one for sale. They used pieces of railroad track, steel I-beams, any big old hunk of iron or steel they could find, but never a "real" anvil. 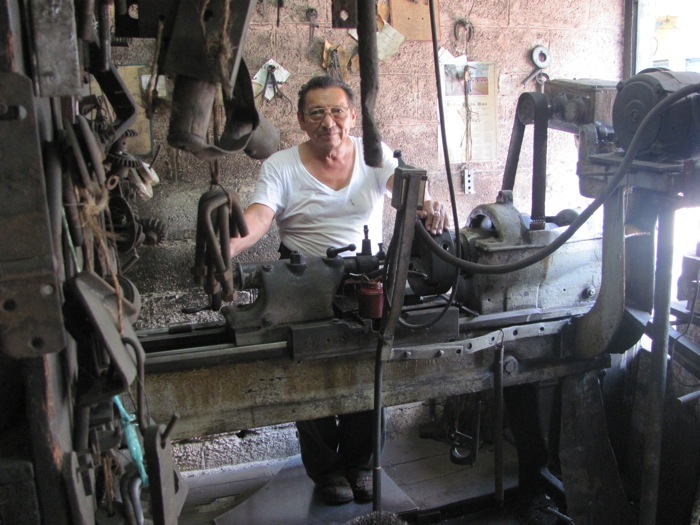 Someone suggested I try looking in the Bazar Fierro, an alleyway near the central Mercado lined with small stalls, each run by a skilled metalworker using ancient metal working drills and lathes. Craftsman there fix and rebuild anything that’s made of metal. And they save everything ....... every nut, broken bolt, rusty washer, screw and every other piece of scrap metal that ever went through the place that might ever find some other use someday! But no yunques. One craftsman, though, took an interest! Jorge. He made a few telephone calls and communicated as best he could in Spanish and a few English words, that yes, someone has a piece of steel that would be the right size and shape for me to use (about 4” x 10” x 16”) I estimated it should weigh about 130lbs, perfecto! So I agreed to come back at 1:00 when he closed, and we would drive to the place that had the steel. I picked him up in my jeep and we drove to a small scrap yard on the edge of Centro. Workers were disassembling huge piles of scrap into their component parts, which would later be sold to recyclers. No piece of steel as Jorge had described earlier, just some “sweet steel” or soft iron bars, and a broken stump of an old anvil – too battered to use. The yards owner spoke English quite well and told me that it was rare to find an anvil here – the broken piece he had was one of probably 3 similarly damaged ones he’s seen in twenty years. _So Jorge and I drove off - home I thought. Instead we stopped at a house in another colonia on the road back into Centro. He said it was his father’s house. We went in and I was introduced to his parents. His father led us out back to a small work shed, and there, partially buried in the ground, was the piece of steel Jorge had described earlier! Apparently his father had used it as an anvil when he ran his own stall in the Bazar Fierro! It looks like it was originally a ram on a very large power hammer, essentially an anvil, and made of hardened steel. Anyway, it rang true when hit with a hammer. So $400 pesos and I have my yunque! Un yunque with good karma. That seems to be how things work around here! Now I needed a section of tree trunk to mount the anvil on. That's another story.